Little is known about Russia’s foreign aid. We examine the evidence to see what makes Moscow's spending different. 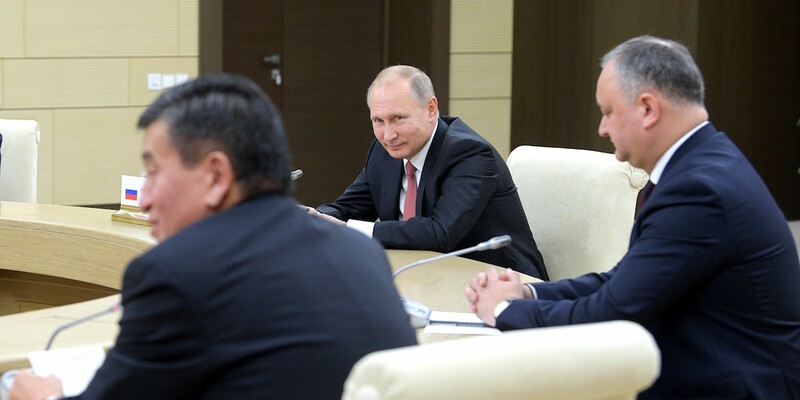 Russia’s President Vladimir Putin (center) and Kyrgyzstan’s President Sooronbay Jeenbekov (left) at an informal meeting of the heads of the Commonwealth of Independent States in December 2017. Kyrgyzstan is the #1 recipient of Russian foreign aid. Photo by the Office of the President of Russia, licensed under (CC by 4.0). Why does a small Central American country more than 10,000 kilometers from Moscow rank as the fourth largest recipient of Russian aid? From 2011 to 2015, the Republic of Nicaragua received nearly US$150 million in Official Development Assistance (ODA) from Russia—not to mention millions more in military aid. Politics helps explain these flows spanning half the globe. Nicaragua is one of the few countries in the world that recognizes Abkhazia and South Ossetia, Russian-backed separatist regions, as independent nations. During the Crimea crisis, Nicaragua also joined a small minority of 11 states to oppose a UN General Assembly resolution on the territorial integrity of Ukraine. These instances and others make it clear that Moscow is once again engaging in checkbook diplomacy via foreign aid. Yet, even as Russian aid has increased 300% since 2010, our knowledge of precisely where the country sends aid, and why, has not. In a recent AidData working paper, forthcoming in a volume on BRICS and the Global Economy, we analyze the existing research on Russian foreign aid to pinpoint characteristics that distinguish its aid from that of other emerging donors. Russia is anything but new to the foreign aid business. Beginning with the aid and trade program in 1953, Soviet support rapidly reached a peak of US$1 billion in 1960—which, as a share of gross national product, was roughly equal to the United States’ aid contributions at the time. Countries in the Middle East and South Asia were top destinations of Soviet aid, with large infrastructure projects, like the construction of a steel plant at Bhilai in India or a highway program in Afghanistan, used to project power and gain allies. Famously, the Soviet Union won the bid for the Aswan Dam in Egypt by offering larger loans with lower interest rates than the U.S. and the United Kingdom, with the objective of drawing the Egyptian President Gamal Abdel Nasser away from the West. 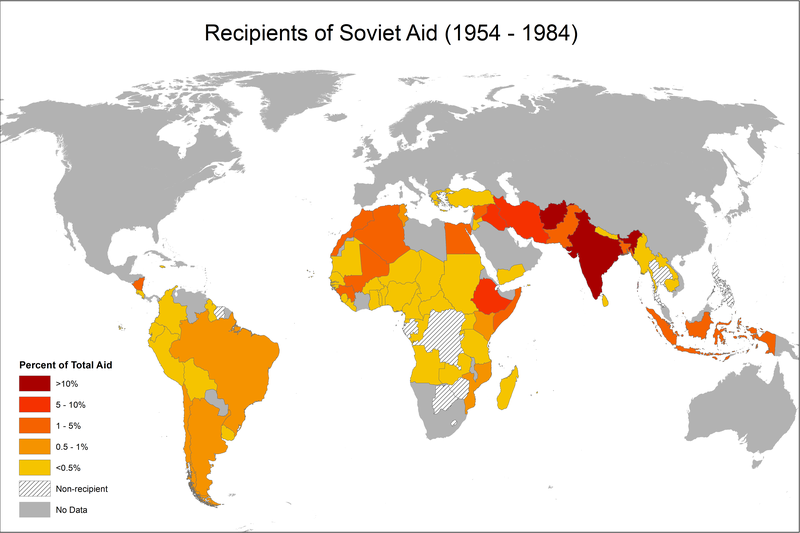 This was no one-off play but an extended political strategy: an analysis of Soviet aid during the Cold War era shows that aid was used to reward (or punish) other countries for their foreign-policy positions. Compared to coverage of aid from other BRICS, the re-emergence of Russian aid under President Vladimir Putin has largely gone unnoticed. Newspapers, policy reports, blog posts and more and more academic journals devote much attention to China’s development cooperation. There are research initiatives on Indian aid and papers analyzing the allocation of Brazilian aid. But why is there so little research about Russian development aid? Click the image to open a high-resolution version in a new tab. 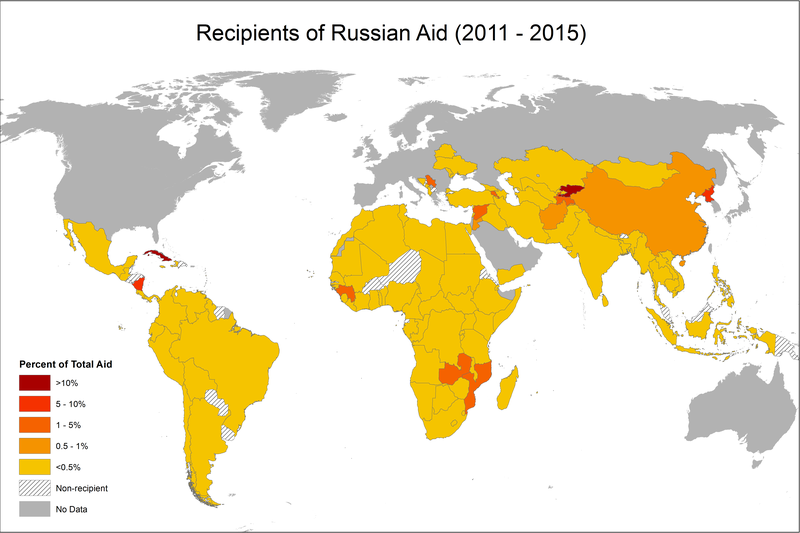 The above maps show the the allocation of Soviet aid (1954-1984) and Russian aid (2011-2015) by recipient country. Figures by Gerda Asmus, Andreas Fuchs, Angelika Müller, and Soren Patterson. Data from CIA and OECD-DAC. One reason for the dearth of scholarship is that Russia, as the legal successor of the Soviet Union, shut down most of its aid activities in the 1990s. Rapid economic decline following the dissolution of the Soviet Union meant that Russia became a net recipient of aid throughout the following decade. Only in the mid-2000s did Russia take notable steps towards restoring its aid donorship, and it was not until 2007 that Russia adopted its first concept note on development assistance. In that note, the Putin government drew on the Millennium Development Goals (MDGs) and listed poverty reduction, disaster relief, and the development of trade and economic partnerships as major goals of its aid activities. But other parts of the document are more open about the geopolitical agenda behind Russia’s aid program. Another reason why we know so little about Russian aid could be Moscow’s lack of transparency. Members of the OECD’s Development Assistance Committee (DAC) follow the same aid reporting standards, but no comparable reporting regime exists for BRICS nations or other non-DAC donors. As part of the accession process to the OECD, Russia began reporting its bilateral ODA positions to the economic organization in 2011. Although tensions with the OECD over Crimea lead to a suspension of Russia’s accession process, the country continues to report its ODA statistics, making it more transparent than most other non-DAC donors. However, Russia only reports total amounts by recipient country—since project-level information is not made available, interested stakeholders cannot paint a detailed picture of Russia’s development cooperation. Despite these limitations, we can learn several important facts about Russian aid from the available data. First, total Russian net ODA disbursements nearly quadrupled from US$231 million in 2010 to US$902 million in 2015 (in constant 2015 dollars). To get a sense of relative magnitude, Russian disbursements in 2015 amounted to roughly half of Italian aid that year. Second, while the transition economies in Eastern Europe and Central Asia together with Latin America receive most of Russia’s aid, Africa is catching up fast. Russia’s annual average contribution to Africa from 2011 to 2015 was about US$30 million according to the latest OECD data—but this still falls short of the aid amounts to Moscow’s main recipients in Asia (US$194 million) and Central America (US$115 million). Third, Russian aid is very heterogeneous. According to Russia’s Ministry of Finance, projects in 2014 included budget support for the Kyrgyz Republic, agricultural machinery supply in Nicaragua, delivery of Russian trucks for humanitarian operations in Afghan remote areas, assistance in Guinea to prevent the spread of Ebola, and humanitarian and food aid to Syria. The vast majority of Russian aid projects go towards education, health, food security, and public finance, but debt relief and debt-for-development swaps are offered as well. While these aggregate statistics provide a first impression of Moscow’s aid activities, longer time series, project-level, and—ideally—geocoded data are needed to shed more light on the role of Russia’s aid in the business of development. This is of growing importance since Russian aid is on the rise, and emerging donors are increasingly challenging the Western-dominated international aid architecture. Only better and more fine-grained data will help us understand how much of Russia’s aid to countries like Nicaragua reflects Moscow’s long-standing relations, how much is part of a systematic plan to secure political support, and how much impact Russia’s aid is having. Gerda Asmus is a Research Associate and PhD Candidate at the Alfred-Weber-Institute for Economics at Heidelberg University. Andreas Fuchs is a Senior Researcher at the Alfred-Weber-Institute for Economics at Heidelberg University. Angelika Müller is a Research Associate and PhD Candidate at the Alfred-Weber-Institute for Economics at Heidelberg University.